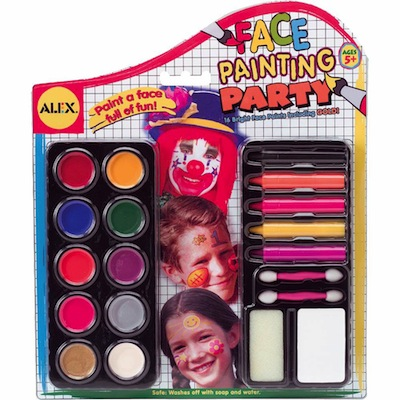 Everything you need for a fantastic face painting party! Includes 10 bright colors, sponge applicators and an assortment of 5 paint sticks for fun designs. Perfect for all kinds of face painting activities! This package contains (5) 2-3/4" face paint sticks in assorted colors, 10 face paint cakes, 1 large white face paint cake, 1 wedge sponge, and 2 applicators. Recommended for ages 5 - 13 years.